When is it okay to start talking about adoption with my child? Should I start the conversation now, or wait until he/she can understand what adoption means? How should I approach this conversation? What can I say to help my child understand? It is completely normal to feel a bit nervous about having the adoption conversation with your little one. However, the earlier you start talking about adoption in your home, the sooner your child starts hearing his or her adoption story, the more comfortable you and your child will be. Typically, the best approach to talking about adoption with your child is to be open and honest from the very beginning of your journey. As a private adoption agency with over 32 years of experience, Adoptions With Love has helped many adoptive parents start the adoption conversations in their home. Below we share some tips for parents on how to tell their children they are adopted, and how to continue the conversation appropriately over the years. From the very first day you welcome your child into your lives, you can begin telling his or her adoption story. It is never too early to start using the word “adoption,” whether it is during a bottle feeding or at bath time. Your baby will likely not grasp what you are saying at first, but this practice can help you gain more comfort with these words over time. Adoption is something that you will continually discuss, intermittently, throughout your child’s life. Getting comfortable with the “talk” is one that will greatly benefit both you and your child long-term. It is also helpful to open the adoption dialogue early on, so that when the time comes, your child will accept, understand, and be comfortable with his or her adoption story. Early discussions can help build self-esteem and provide a sense of safety and security for your child. From the beginning, he or she will know how much love was put into the adoption plan. As a parent, it is important to make this a lifelong conversation. You do not just tell your child about adoption once. The more you talk about it, the more your child will be comfortable with it. He or she will also be more comfortable asking questions. At Adoptions With Love, we recommend talking about adoption often, when the opportunity arises, throughout every stage of your child’s development. Many parents turn to adoption books for young children. 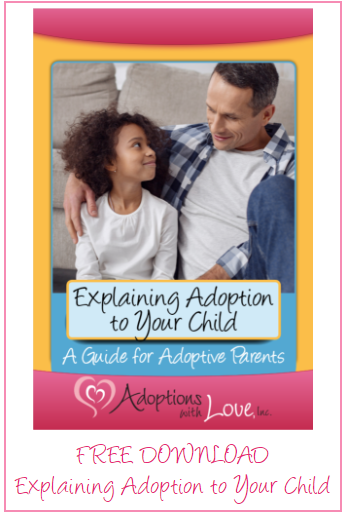 These can help your child understand and relate to other adoption stories. Telling a child about adoption early on can make it a very natural experience – Because they have always known their story, they will not remember a solitary “stand out” or “shocking” moment in which they were told. In addition to having the conversation early and often, it is also important to be mindful of language when telling your child they are adopted. Use language that is appropriate for your child’s developmental level. This will evolve as your child grows, of course. The discussion with a preschooler will be much different than that with a middle schooler. No matter the age, however, it is important to always send the message that the adoption is a positive, loving way that your family came together. Your child will be happier and more confident in his or her adoption story if it is one that sends a message of pride and happiness. The “why” questions will likely start at the toddler and preschool phase, but young children are often pleased with simple answers such as “because we knew you were meant to be ours!” This will help your youngster feel loved and truly at home where he or she belongs. Just like you know the best way to raise your child, you will know how to continually address the conversation of adoption. As your little one grows and develops through the elementary and middle school ages, he or she will likely have more in-depth questions regarding the adoption and his or her birth parents. Try not to fret as these questions are asked. Instead, encourage these questions. It is very normal and healthy for a child to be interested in his or her biological background. 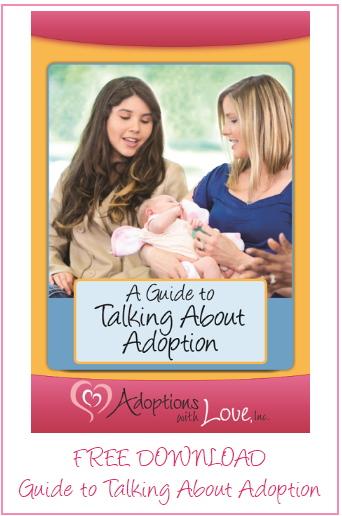 If you keep the conversation open and honest – and stay mindful as to what information your child can grasp at the given age – you will continue to bond with your child through these adoption discussions. Today, over 97 percent of adopted children over the age of five know that they were adopted, and 90 percent of these children have reported having positive feelings about their adoption experience. For more advice on when to tell a child they are adopted, as well as age-appropriate language to help you navigate the uncharted waters of this journey, please download our free guides below. If you would like information adopting a child in MA, please call 617-964-4357.